Sour Apple Soda: Soda pop with tart green apple flavor. 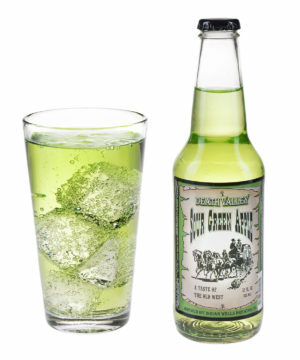 Sip on tart and tasty Death Valley Sour Green Apple Soda for a treat that'll satisfy your sweet and sour tooth. This artisanal soda is made with pure cane sugar and the flavors from a unique combination of Granny Smith, McIntosh, and Pink Lady apples along with a blend of delectable spices. The bottle of bubbles boasts the familiarly tasty flavor of sour apple with subtle complexities that make it all the more delicious.